Thus far, Dr. Emtage and I were able to conclude the molecular chaperone, Hsp42, helps to target and metabolize mutant Huntingtin protein aggregates in S. cerevisiea models. What we have set out to do has been successful! There is very literature out now which elaborates on Hsp42’s, in particular, role in processing mutant Huntingtin. Currently, Dr. Emtage has pushed our research even deeper. We are now working on figuring out how Hsp42 proteins localize within the cells. 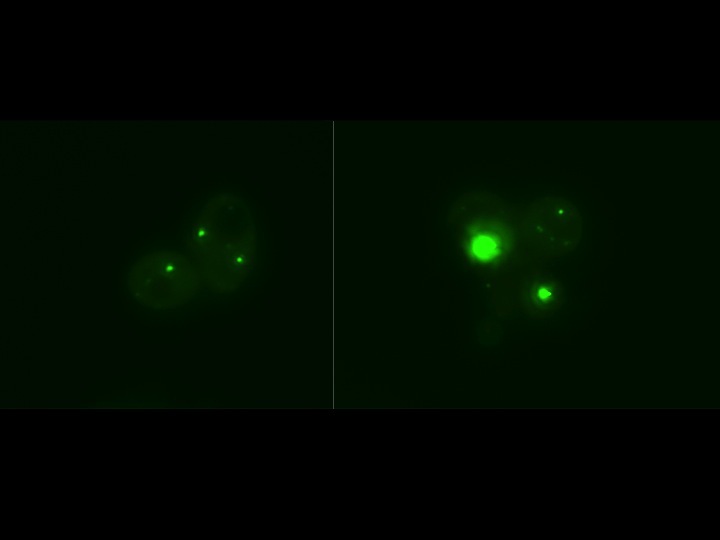 To do this, we are attempting to label specific proteins associated with the spindle pole body (SPB), such as Spc42, with a fluorescent protein( FP) in order to image both the SPB and Hsp42 proteins. This will allow use to determine if Hsp42 does move about the cytoplasm using the SPB. We are currently looking at other SPB proteins to label with FP as well. I am currently working on making inducible mutant Huntingtin plasmids with polyglutamine lengths of 25Q (control) and 72Q (pathogenic) controlled under a GAL1 promoter. This will allow us to essentially mediate the amount of Huntingtin protein aggregates generated within the cells. Our current Huntingtin plasmids use a constitutive promoter, GPD, which means the Huntingtin is always expressed. With a GAL1 promoter, we will be able to “switch on and off” Huntingtin expression. With these new plasmids, we hope to investigate how aggregates are processed and in what amount of time within our models. Doing this in conjunction with FP labeling certain proteosome proteins will hopefully allow use to determine the individual steps of mutant Huntingtin metabolism or catabolism. The hypothesis here is the Huntingtin aggregates are targeted by Hsp42 either for re-folding or ubiquitination. We hope to determine which one to be the case very soon. This will be my last blog. Thank you for reading and thank you Pace University for allowing this research to reach this point. So far, we have made plasmid constructs of mutant Huntingtin displaying varying lengths of polyglutamine repeats (25Q, 72Q, and 103Q) with and without a proline rich region (PRR) tagged with green fluorescent protein (GFP). The 25Q is our control because the strain does not exhibit toxicity. We have found that the 72Q and the 103Q strains with and without the PRR exhibit toxicity by observing large inclusion bodies (IBs) of Huntingtin aggregates through fluorescent microscopy. Next we observed the effects of the molecular chaperone, Hsp42, on mutant Huntingtin and have found that in Wild-Type cells, the IBs were less intense than in Hsp42null cells indicating that Hsp42 is necessary in clearing mutant Huntingtin aggregates. We then tagged Hsp42 with another red fluorescent protein (mCherry) and found that the molecular chaperone localizes with the mutant Huntingtin aggregates. We are currently in the process of tagging the spindle pole body with mCherry in the 72Q strains in order to determine whether the mutant Huntingtin aggregates localize by means of the spindle pole body while forming an aggresome. Results should be within a week or so. This week we are constructing a new plasmid which is inducible so that we can essentially “turn on and off” the amount and degree of mutant aggregates formation. We hope this will allow us to monitor how cells process mutant aggregates through the ubiquitin-proteasome system. After constructing the plasmids for the mutant Huntington genes tagged with GFP, we were able to image Huntingtin effects on Wild-Type and Hsp42null S. cerevisiea strains. As the image above shows, mutant Huntington with a polyglutamine tail length of 25 repeats has displays no toxicity in the Wild-type and Hsp42null strains. Diffuse backgrounds in both strains are present with no large Inclusion Bodies (IPs). Mutant Huntingon with a polyglutamine tail length of 72 repeats displays toxicity because of the IPs present in Wild-Type and Hspnull strains. As shown above, IPs are less bright and less concentrated in the Wild-Type strain than in the Hsp42null strain indicating that Hsp42 is needed in reducing aggregation. Above is an image of large Inclusion bodies (IPs) as well as small aggregates in Wild-Type (Left) and Hsp42null (right) strains. 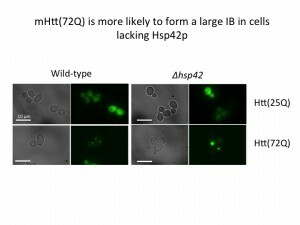 IPs are almost twice as likely to form in the Hsp42null strain. However, the number of small aggregates are unchanged in Wild-Type and Hsp42null strains. Hsp42, a molecular chaperone, targets mutant Huntingtin aggregates for refolding. Huntington’s Disease is one of several neurodegenerative diseases’ that exhibits pathology through the formation of plaques surrounding neuron cells eventually leading to cell death. The Huntington (Htt) protein, when in its native state, is harmless to cells. When the Htt protein becomes mutated, its polyglutamine repeat elongates and eventually mis-folds the protein into a non-native state leading to the formation of aggregates. One mechanism for cells to counteract the accumulation of mis-folded proteins is by the utilization of molecular chaperones also known as heat shock proteins. Several heat shock proteins have been tested on in yeast Huntington models such as Hsp70, Hsp90, and Hsp104. Each of the three molecular chaperones is thought to counteract non-native proteins by targeting aggregates for re-folding or ubiquitination through the cellular proteasome pathway. The small heat shock protein, Hsp42, is known to counteract non-native protein formation in prion [PSI+] disease models by a similar mechanism to other molecular chaperones, however Hsp42’s role in Huntington disease models has yet to be illuminated. Objectives include evaluating the effects of Hsp42 on mutant Htt mis-folded proteins, understanding the mechanisms of Hsp42 expression in comparison to other heat shock protein families, and ultimately to find possible therapeutic means in which to counteract Huntington pathology using Hsp42 as the primary molecular chaperone. Aim 1: To determine the effects of Hsp42 expression on mutant Huntington proteins displaying three different lengths of polyglutamine (polyQ) repeats: Htt25Q, Htt72Q, and Htt103Q. Htt pathology is determined by the length of its polyQ (CAG) repeats. The longer the glutamine repeats, the more toxicity mutant Htt protein displays. Htt25Q is known to be non-toxic to cells while Htt72Q is known to form insoluble aggregates and Htt103Q is the most toxic of all mutations forming the highest concentration of insoluble cytoplasmic aggregates. We will define the mechanisms in which Hsp42 works on all mutant Htt protein aggregates within S. cerevisiae models and whether localization is determined by the cytoskeleton microtubules. Aim 2: To differentiate Hsp42 activity compared to the mechanisms of other molecular chaperones such as Hsp40, Hsp70, and Hsp104 when expressed in S. cerevisiae models. Known molecular chaperone activity with Htt expression include the heat shock proteins Hsp40, Hsp70, and Hsp104. In order to fully understand Hsp42’s effects on Huntington, other molecular chaperone mechanisms must be evaluated and understood. We will isolate and define whether Hsp42 is associated with a particular family of molecular chaperones or whether it works uniquely to other heat shock proteins. Aim 3: To determine whether Hsp42 can work in conjunction with other molecular chaperones to counteract Huntington toxicity. Molecular protein complexes have been shown to work together in counteracting mis-folded protein aggregation such as the Hsp40/Hsp70 complex. After evaluating the effects of specific molecular chaperone families on Huntington pathology, we will attempt to identify whether Hsp42 can work together with other heat shock proteins in clearing Htt aggregates from cells. The small heat shock protein, Hsp42, has been shown to localize non-native protein aggregates to the peripheral regions (IPODs) within the cell’s cytoplasm. Protein targeting and re-folding are assisted by the expression of Hsp42. Interestingly, Hsp42 is a constitutively active molecular chaperone. One other heat shock protein, which is known to work in conjunction with Hsp42 is Hsp26. The N-terminal domain (NTD) of hsp42 displays high variability in nucleotide sequences as well as varying lengths. The NTD is thought to mediate functional specificity of Hsp42 and Hsp26/Hsp42 complexes. When the NTD sequence of Hsp42 is deleted and transformed into yeast models, aggregates localize to the juxta-nuclear region (JunQ). In strains expressing Hsp26 with the NTD of Hsp42 deleted, IPOD localization of aggregates was restored, however in vivo Hsp26 activation is only induced by heat stress. In prion [PSI+] models, Hsp42 has been shown to target/bind to non-native proteins preventing aggregation and assisting non-native protein folding into native protein conformations reducing cellular toxicity under elevated stress. The gene encoding the Htt protein is non-toxic to animal neural cells but can become toxic through mutations in the Htt gene. Pathology in Htt mutants exhibit expanded polyQ residue repeats, >25Q leading to toxicity. Through the expansion in the polyQ tail, pathogenicity is accompanied by the mis-folding of the CAG or CAA repeats, producing non-native Htt protein aggregates. Upon the accumulation of mutant Htt proteins, neurons are thought to undergo apoptosis, thus leading to neurodegenerative pathology. The Htt103Q mutation exhibits the most potent toxicity in cell models while the Htt25Q mutation appears to display no detrimental effects. It is also believed that Htt toxicity is partially due to the deletions of flanking Proline-Rich Regions (PRR) along the polyQ repeats, thus the pathology of Huntington is partially masked by the PRR. The heat shock proteins Hsp70 and Hsp104 have been shown to effect Huntington aggregation. When over-expressed, Hsp70 displays around two intense foci from GFP-tagged mutant Htt proteins as opposed to wild-type cells showing one intense aggresome. Hsp104 displays a similar effect, having more than one less-intense foci and showing diffuse fluorescence indicating soluble Htt protein fragments. Interestingly, it is thought that in Hsp104null strains, pathology of the Huntington protein is absent; indicating that expression of Hsp104 also may facilitate Htt toxicity. Molecular chaperones have a distinct effect on Huntington aggregation. I propose to investigate the role of the small molecular chaperone, Hsp42, on Htt aggregates exhibiting polyQ repeats of 25Q, 72Q, and 103Q. I believe that the over-expression of Hsp42 will result in reduced toxicity, less aggregation, and diffuse Htt fragments in mutant Huntington S. cerevisiae models. The mechanisms by which Hsp42 acts on mutant Htt proteins are to be examined. Where does Hsp42 localize to within the cytoplasm as Htt aggregation occurs? Where do the Huntington proteins localize to in the cell when Hsp42 is over-expressed? Do they localize by utilizing microtubule pathways within the S. cerevisiae cytoskeleton? Does Hsp42 have an effect on the flanking PRR? Will localization of Huntington proteins change when Hsp42 is deleted and thus is not expressed? How long does it take for mutant Htt aggregates to form when Hsp42 is over-expressed? Does Hsp42 hinder Htt protein formation or does it only act on Htt proteins after they have formed? Can Hsp42 be linked with other heat shock proteins when counteracting Htt aggregation? We will investigate each of these questions in the hope of unmasking the exact mechanisms in which Hsp42 acts on Huntington aggregation pathology. Overexpression of Sis1, a member of the Hsp40 family, leads to formation of two less-intense foci as opposed to one large single focus (Lindquist, 1999). Overexpression of Ssa1, a member of the Hsp70 family, leads to a higher background of diffuse fluorescence and multiple less-intense foci (Lindquist, 1999). Overexpression of Hsp104 increased the number of less-intense foci as well as the fluorescent saturation of the background. Overexpression of hsp104 increased the number of foci as well as the fluorescent saturation of the background (Lindquist, 1999). The number of glutamine repeats as well as the inclusion or deletion of the flanking proline-rich regions determines Huntington toxicity. In Huntington, two proline residues, which are separated by a proline rich region, are located at the carboxyl terminus of the polyglutamine repeat. Mutant plasmids with deletions in the proline rich region are believed to increase toxicity and reduce solubility of Huntington aggregates. In vitro, oligoprolines decrease the rate of synthetic polyglutamine aggregation (Dehay 2006). It has been speculated the proline-rich region may act to recruit protein interactors, which protect the cell from toxicity or, alternatively, the proline-rich region may act to change Huntington polypeptide conformations. Aim 1: To determine the effects of Hsp42 expression on mutant Huntington proteins displaying three different lengths of polyglutamine (polyQ) repeats: Htt25Q, Htt72Q, and Htt103Q. The haploid wild type S. cerevisiae strain BY4742 – MATalpha his3Δ1 leu2Δ0 lys2Δ0 ura3Δ0, will be used for all transformations. Hsp42 will be amplified by PCR with Topo TA over-hangs on the 5’ and 3’ end of PCR product. The PCR product will then be inserted into a Galactose inducible pYES 2.1/V5-His-TOPO plasmid allowing for ampicillin selection after bacterial transformation. The bacteria will then be incubated, harvested, and mini-prepped. Plasmids extracted will then be transformed with lithium acetate into WT and Hsp42null strains. The strains will then be selected for using the Ura3 marker. Huntington Plasmids used for PCR are 1181 htt p426 25Q GPD, 15576 p426 htt25QDPro GFP, 1188 htt p426 103Q GPD, 15833 htt p303 FLAG 72QDPro GFP (may have sequencing problems), and 15582 htt p416 GAL 72Q+ProGFP. It should be noted that the polyglutamine repeats in the Htt proteins interchange between CAG and CAA for stability. All primers will include a 5’ XbaI over-hang and a 3’ SalI over-hang for insertion into a p415 template with a constitutive GPD promoter. Cloned Htt p415 plasmids will then be transformed into bacteria and selected for using ampicillin. Bacteria will be harvested and mini-prepped. All Htt plasmids, 25Q, 25QDP, 72Q, 72QDP, 103Q, and 103QDP will be will then be transformed into WT, WT+Hsp42, Hsp42null+Hsp42, and Hsp42null strains and selected for using URA3 and LEU2 markers. All strains will then be grown to mid-log phase and examined using confocal fluorescence microscopy. Hsp42 expression in Htt models will be induced by galactose and aggregates will be monitored in WT, WT + over-expression, Hsp42null, and Hsp42null + expression. Comparisons in imaging will be compared, contrasted, and analyzed using Velocity software in all cloned strains. Aim 2: To differentiate Hsp42 activity compared to the mechanisms of other molecular chaperones such as Hsp40, Hsp70, and Hsp104 when expressed in S. cerevisiae models. Monitoring heat shock protein activity will be achieved by tagging molecular chaperones with a mCherry FP. Integrating the mCherry nucleotide sequence into the hsp42 strains will be done directly by homologous recombination of the mCherry PCR product into the hsp42 chromosome. Protocol is the same as the lithium acetate transformation protocol, only using the PCR product for transformation rather than a plasmid for fusing. After mCherry fusion, Hsp42 will be monitored for localization and concentration when expressed or over-expressed in cloned Htt-GFP strains. We will then analyze the degree of Htt aggregation, diffusion, and localization in conjunction to Hsp42 activity, thus illuminating Hsp42’s mechanisms on clearing Htt aggregates from the cellular cytoplasm. We will then repeat the cloning procedures with the molecular chaperones Hsp40/Hsp70 complex and Hsp104 tagged to Citrine under an inducible promoter, such as GAL1. Analysis of the activity of these heat shock proteins will be monitored using fluorescent microscopy and then be compared to Hsp42 activity. Aim 3: To determine whether Hsp42 can work in conjunction with other molecular chaperones to counteract Huntington toxicity. WT+ Hsp42 + Hsp40/70 or Hsp104 over-expression, Hsp42null + Hsp40/70 or Hsp104 expression, and Hsp42null+Hsp40/70null or Hsp104null strains will be sub-cloned and, using fluorescence microscopy, Htt proteins will be monitored for aggregate foci and diffuse fluorescence indicating protein solubility to determine. Molecular complexes with Hsp42 and another candidate heat shock protein will be analyzed for mutant Huntington protein dispersion and we will determine whether Hsp42 can act in conjunction other molecular chaperones in clearing Huntington aggregates. Possible FP tagging on Hsp40/70 and Hsp104 will be Citrine. This will allow us to visually distinguish between the Htt-GFP, the Hsp42-mCherry, and Hsp40/70 or Hsp104-Citrine. Further investigations into the mechanisms of molecular chaperone activity on clearing Huntington aggregates in cells is needed in order understand methods of counteracting Huntington pathology. As of today, Huntington as well as other neurodegenerative diseases displaying mis-folded protein activity (Alzheimer’s, spongiform encephalopathy, etc.) has no definite cure. If molecular chaperones function to clear non-native protein aggregation, perhaps this is one route researchers can proceed with in finding therapeutic means in clearing Huntington toxicity in mammalian neurons. The molecular chaperone, Hsp42, currently has very little literature surrounding it within the context of mutant Huntington cell models. I believe Hsp42 will have a drastic effect on clearing Huntington mis-folded proteins and that Hsp42 will be able to work with other molecular chaperone families in reducing Huntington aggregation, fragmenting Huntington proteins into a soluble state, and clearing non-native proteins, thus reducing Huntington pathology. Craig, E. A. “Heat Shock Proteins: Molecular Chaperones of Protein Biogenesis.” Microbiology and Molecular Biology Reviews 2.57 (1993): 402–414. Dehay, Benjamin. “Critical Role of the Proline-rich Region in Huntingtin for Aggregation and Cytotoxicity in Yeast*.” The Journal of Biological Chemistry 281.47 (2006): 35608–35615. Flumara, Fernando. “Essential Role of Coiled-coils for Aggregation and Activity of Q/N- Rich Prions and polyQ Proteins.” Cell 143.7 (2010): 1121–1135. Haslbeck, Martin. “Hsp42 Is the General Small Heat Shock Protein in the Cytosol of Saccharomyces Cerevisiae.” The Embo Journal 23 (2004): 638–649. Lindquist, Susan. “Aggregation of Huntingtin in Yeast Varies with the Length of the Polyglutamine Expansion and the Expression of Chaperone Proteins.” PNAS 97.4 (2000): 1589–1594. Print. Mason, Robert. “Modeling Huntington Disease in Yeast Perspectives and Future Directions.” Prion 5:4 (2011): 269–276. Specht, Sebastian. “Hsp42 Is Required for Sequestration of Protein Aggregates into Deposition Sites in Saccharomyces Cerevisiae.” J Cell Biol. 195(4) (2011): 617–629. Swayne, Theresa. “Live-cell Imaging of the Cytoskeleton and Mitochondrial-cytoskeletal Interactions in Budding Yeast.” Methods Mol Biology 588 (2009): 41–67. Tauber, Eran. “Functional Gene Expression Profiling in Yeast Implicates Translational Dysfunction in Mutant Huntingtin Toxicity.” The Journal of Biological Chemistry 286.1 (2011): 410–419. Young, Carissa. “Cassette Series Designed for Live-cell Imaging of Proteins and High-resolution Techniques in Yeast.” Yeast 29 (2012): 119–136. Author cb58008nPosted on November 4, 2013 Categories Chekkapong BurudpakdeeTags huntingtin, molecular biology, neurodegenerative diseaseLeave a comment on Hsp42, a molecular chaperone, targets mutant Huntingtin aggregates for refolding.